2017: John Lombardo, driver, and Rick Jackson, team owner of Top Alcohol Funny Car. After first round of qualifying at Topeka, Kansas, JHE had number 1 qualifiers in six different classes. Both Top Alcohol Funny Car and Top Alcohol Dragster entries dominated qualifying, proved fastest in every round and claimed final victories. Based in Mooresville, North Carolina, Joe Hornick Enterprises (JHE) is one of the foremost specialist companies in the field of race engine research and development. From professional and Sportsman drag racing classes to NASCAR and from short-track ovals, both dirt and asphalt, to pulling trucks and tractors, JHE commits its full capability to one team per category. Joe Hornick was born and raised in Madison, Minnesota. He moved to Mooresville, NC, where he spent ten years working with NASCAR specialists Joe Gibbs Racing. His research and development prowess contributed to the team securing three fabulous national titles. At the end of 2002, he switched to NHRA Pro Stock and led KB Racing to four consecutive national championships: 2003, '04, '05, and '06. For the following two seasons, 2007 and '08, he joined Cagnazzi Racing where he delivered a further two Pro Stock championships to Jeg Coughlin. 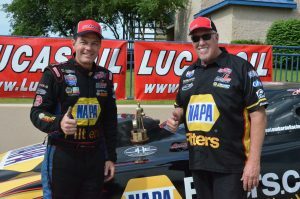 So far, in every category of racing in which Hornick has participated, championship victories have followed, including his contribution to Robert Hight's 2017 NHRA Funny Car national title. Formed in 2012, Joe Hornick Enterprises is the stamp of innovation that enables each race team to prosper. JHE’s system development programs typically embrace competition rocker systems, entire valve train systems, intake systems, including cylinder heads. When creating a new racing cylinder head design, JHE employs a process which first establishes an efficient hand-ground port shape.